Where do powerful strategies come from? How do some companies develop strategies that enable them to outperform others regardless of the state of their industry or the economic climate? How does a company get the essentials to work in regard to the company’s strategies, such as leadership buy-in and follow through on implementations and performance management, without being slow, rigid and check-box focused? 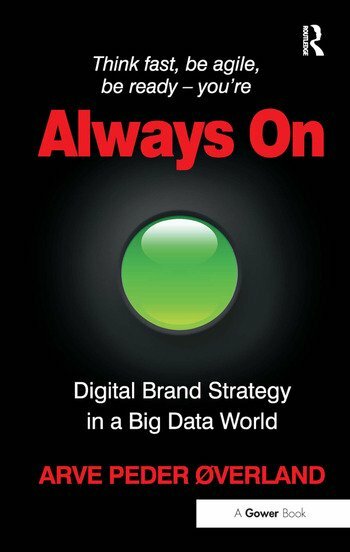 These are some of the questions asked by Arve Peder Ã˜verland in Always On: Digital Brand Strategy in a Big Data World. This book will provide an understanding of what it takes to develop, implement and run a digital strategy but it is not meant as a rigid process document that must be strictly adhered to. Companies have different needs and live in vastly different environments. The internal structure of an organization and the market in which it competes is not going to adapt to a digital strategy process, it must find a process and methodology that works best for it. With big data emerging as a standard framework for decision making, digital strategy and governance have taken on increased importance. It’s a given in today’s online marketplace that you are perceived as being always on. Make sure your governance programmes for your systems and platforms keep it that way. Think fast, be agile, be ready - you’re always on! Arve Peder Ã˜verland has been at the forefront of digital marketing since the mid-nineties. He has spent most of his career in the United States, where he led a digital agency, working with some of the world’s leading companies and brands. Before joining id.mngmnt, a management consulting firm specializing in customer intelligence as a partner, Arve served as Digital Practice Director for Hill+Knowlton Strategies Europe, a WPP company. At id.mngmnt, Arve heads up the digital consulting practice, focusing on building result-oriented digital strategies for clients and developing governance practices that reduce risk and monitor performance.